What is the WS12A Wall Switch? The WS12A is a simple Decorator Wall Switch. It has an elegant decorator design that looks great in any decorator style switch cover. The switch also dims locally and remotely. The switch also has a Resume Dimming function which enables your lights to remember their last set dimming level and turn on and off to that same level. The switch also comes with the Soft Start feature. This feature eliminates the sudden brightness and harsh adjustment of the sudden brightness of turning on the lights. The Soft Start Feature creates a smooth transition from Off to On by ramping up power to the unit over a 2 second period. This creates a pleasant and high class look to your home lighting. This switch allows for control and dimming both locally and remotely with any X10 Controller. NOTE: The WS12A Decorator Dimmer Switch works with incandescent bulbs and some dimmable alternative lighting (ie dimmable LED/Fluorescent). Due to the dimming capabilities and Soft Start feature that ramps up the brightness, if you have alternative lighting, a WS13A On/Off Relay Switch may be more appropriate. What are the advantages of using the WS12A Wall Switch? What other products work with the WS12A Wall Switch? If you are looking to replace a switch that is in a 3-Way configuration (two switches operate the same light), use the WS14A Secondary Switch at the site of your current secondary switch. 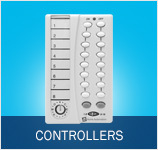 If you want to control this switch remotely, check out our Controller Section.